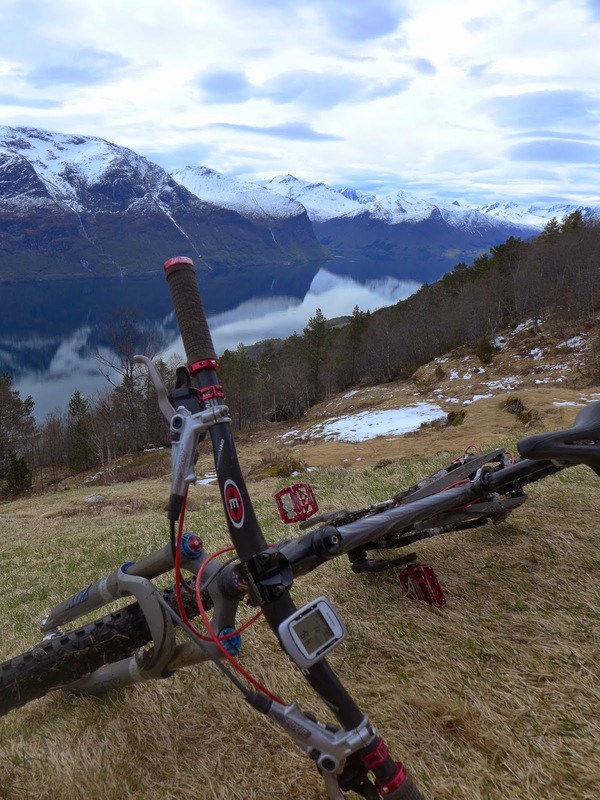 This is the second post on my easter vacation spent mountain biking in western Norway. Check out the first post here! I jumped on my bike and started pedalling up the tractor road. After a flat stretch, the road grew progressively steeper, and I watched my heart rate spike on my Garmin. 170....180...185...190... and I'm done. Too early on what could potentially be long day to burn out the legs. I got off my bike, and began pushing it up the hill. Audun quickly passed me, but eventually stopped for a breather. "I'd like to see a tractor drive up this hill," I commented. Tractor road to the sea. We were in Fræna, on the west coat, where mountains no longer meet fjords but open sea. The goal for the day was Sjurvarden, inspired by a local's creative, single-handedly filmed video. 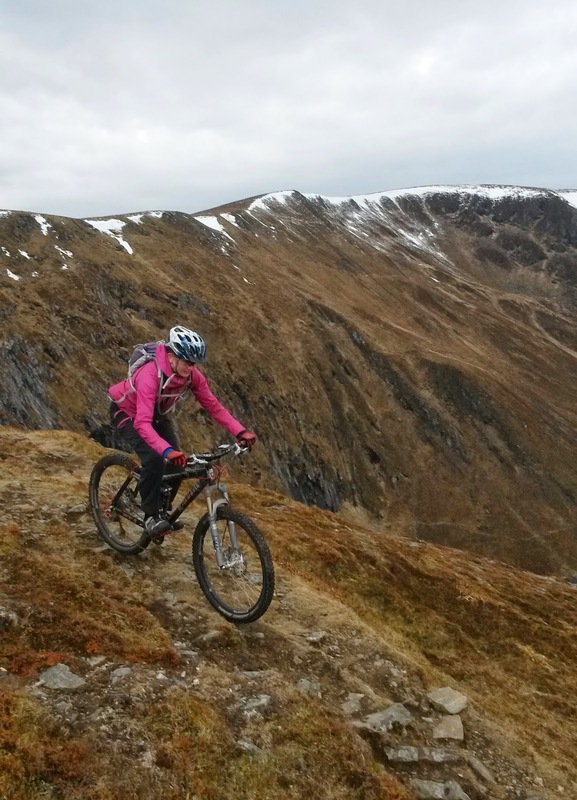 Sjurvarden is a mountain only 667 meters high, but when you start from sea level, with a 12 kg mountain bike to boot, that's a quite a bit. The first 200 vertical were on steep, unrelenting tractor road. The road seemed to have been graded by someone aiming to punish rather than facilitate. 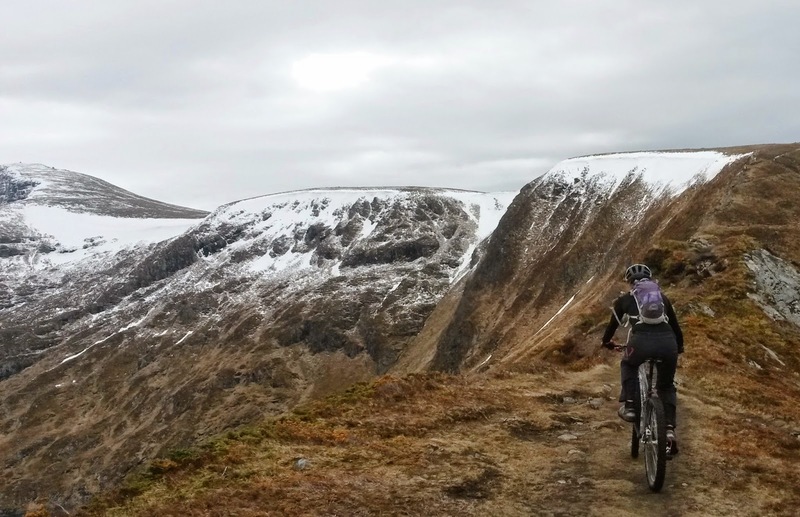 I alternated between pushing my bike and pedalling until my legs started to protest. At Skottenvatnet lake, the tractor road turns into a trail. But this is also where the wind picked up. It came upon us suddenly, as we rounded a small corner in the road. It was like there was some magic wind protection that suddenly disappeared, allowing rambunctious gusts to throw us off balance. All of a sudden my cushy, stable bike seat felt like a rather precarious perch. Still we continued upward, because "the wind might die down higher up on the mountain!" enthused Audun. I personally have never experienced wind to die down higher up on mountains, but was ready to be impressed. After all, the scenery was stunning, and there's nothing like pushing your bike up a really big hill! 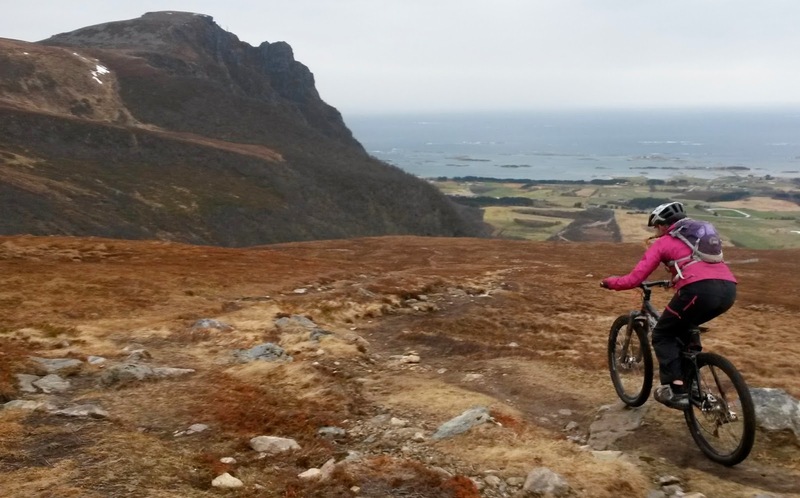 Audun biking on the spongy, rocky trail, which continues up the ridge in the left of the picture. We rounded the ridge, which grew sharper and more spectacular, winding up towards a saddle. At the saddle you could choose to either head right for Sjurvarden, our goal, or Melen, a slightly higher peak. I was gingerly pedalling along the compact single track when I saw it. A green mailbox, the sure sign of a trail book. I stood up and gunned it for the mailbox. Mistake! I love trail books. The simple act of writing my name and the date seems to imprint me into that particular place. You can trace the lists of peoples names, see people who jog here every day, people who hike up with their families. They all had their own stories, their own adventures, right here. And now you are a part of it too. Before I could open the mailbox to inscribe myself in the sacred tome (usually a cheap, spiral-bound notebook), an enormous gust of wind blew me off the saddle. It happened so slowly, I had time to consider the gravelly path below me that my chin was on its way to dig into. I happily managed to prevent this face-path meeting. I sat up, slightly shaken, and look over at Audun. Only he was no longer on the path. He had been thrown off his bicycle as well, even farther down the hill than me. An odd combination of strangled laughing and crying gurgled its way out of my throat. I was both scared and kind of relieved that nothing bad had happened. Either way, we decided that the mountain had defeated us for that day, and turned around. We enjoyed the trail down from the ridge so much, we pushed our bikes back up to the ridge for a second round. Audun descends towards the sea. I like the contrast between the alpine terrain and the farmland below. The next day we decided to take a break from biking, so we went running instead. The only thing problem was that we were in inner Sunnmøre, where everything is either steeply uphill or steeply downhill. So we ran down the big hillside Audun's grandmother's farm is perched on and then we ran back up. And then ran up to a summer seter, Relligsætra, for good measure. Have I mentioned that Audun is a freak of nature who is always in remarkable good shape? All the running I've been doing didn't seem to help at all, and I totally burned out my calves on the uphill and my quads on the downhill. Post-run yoga! Note the valley bottom floor below... We were there! This, of course, meant that I felt rested and great the next day. Not. The weather was perfect, and we had some nice trails planned to explore, but when I got on the bike I felt completely burned out. So I turned around, and agreed on a rendezvous point so Audun could get a ride in a least. The rendezvous point had a great view. I also ate ice cream, which has been shown by subjective data to improve recovery. On Saturday, we decided to drive back to Oslo for Easter weekend. It's a long drive, though, so Audun got in touch with a friend on the way so we could stop to stretch our legs. On bikes. 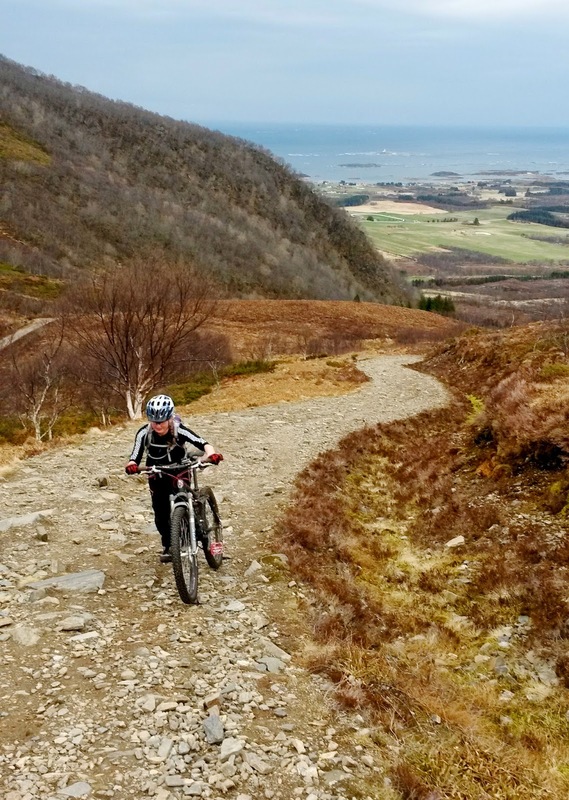 We biked up a dirt road to the parking place for a popular ski peak, Smørbotntind. I've been there before to go skiing, and it was kind of odd watching people putting skins on to go up to the snow, while we were down there, avoiding it. Audun and Truls poise at the start of the trail. Note the giant, snow capped mountains in the background. We followed a trail from the end of the road up to an old seter, Einangsætra. The technical uphill trail is probably ridable in good conditions, but it was very wet and there were a number of snow patches. Bike pushing it is then! The view from Einangsætra was breathtaking. 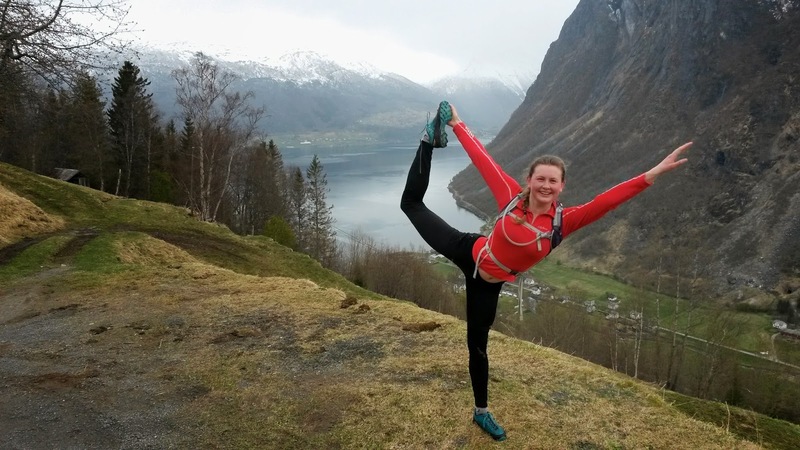 There really is no place like Romsdalen for aesthetic, Norwegian mountains. The Man and the Mountains, the town of Åndalsnes sprawled out below the fjord. Casper enjoyed the view as well. Satisfied with our 2 hour leg stretch, we drove the remaining 450 km to Oslo and got in before my bedtime. On Easter Sunday we decided to explore some new trails in forest around Oslo.The Oslo forest contrasted starkly with the steep, mountainous rides of the previous days. We were in the forest and everything was quieter, more rolling and greener. We still did some bike pushing though. Audun in the patchy forest sunlight. It was a gorgeous day, probably 20 C out (something we don't see a lot in Norway in April!). We biked 20 km of trails, including a visit to Lillosætra for cinnamon buns. I was completely exhausted by the end. Long-distance mountain biking takes it out of me in a way running never does. 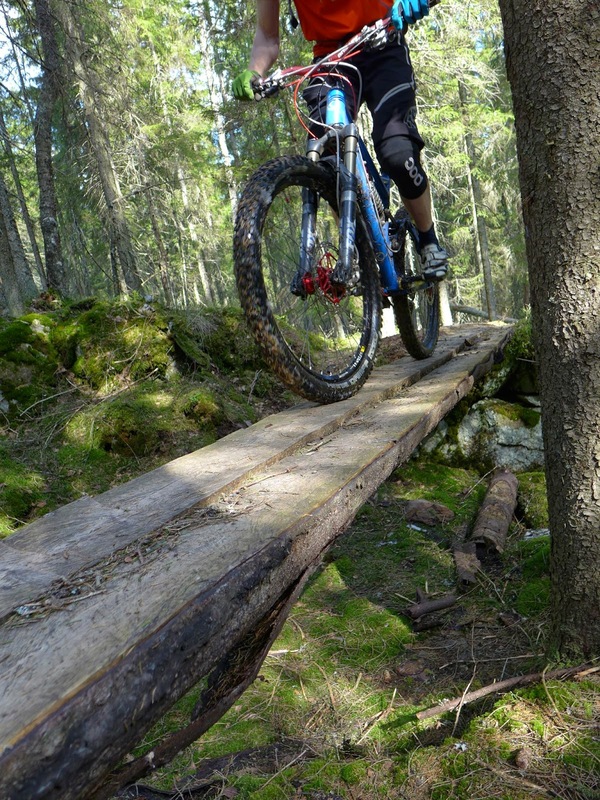 It think it has to do with the fact that technical terrain takes a lot of concentration as well as power. And that there's virtually no way to get up a steep hill without raising my HR obscenely! Someone built a Northshore. Out in the middle of the forest! So now that I've had a biking vacation, I have to get back to RUNNING! I do, after all, have an ultra marathon to complete. More on that later. Lovely photos. I agree, ice cream does help recovery.